Auckland Libraries, Sir George Grey Special Collections, Med. 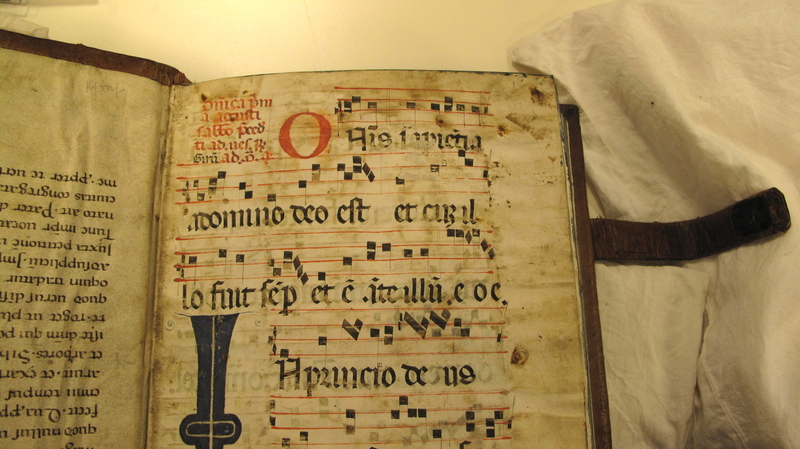 MS S.1588 Antiphonal, Italy, sixteenth century – by Alexandra Barratt and Alexandra Gillespie. 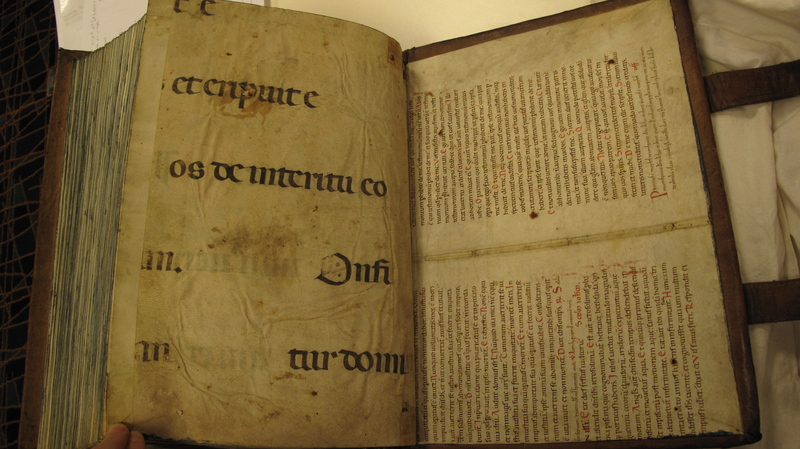 The binding of this book is at least its second—an earlier set of sewing holes is visible in the quire folds (see for example fols. 132-3). Manion, Vines, and de Hamel describe it as bound “in post-medieval calf over wooden boards (re-covered but possibly using original boards and fittings).” They note the use of leaves from several medieval manuscripts for fly leaves (an early twelfth-century Italian copy of the Latin life of St Donatus; a late twelfth/thirteenth-century Italian Missal; and a sixteenth-century Italian choirbook). From the same evidence we conclude that the present binding is in large part sixteenth-century, contemporary or near contemporary with the manuscript itself, despite later conservation work. Several features of the binding are of note. It is a very large book and bound in two heavy wooden boards (260 x 370 mm and >15mm thick). The boards are bevelled and flat. The cover is tooled, ruled blind using finely patterned fillets and small stamps—single leaves and trefoils—appear in corners of the lozenges created by the rules and surrounding the metal furnishings. 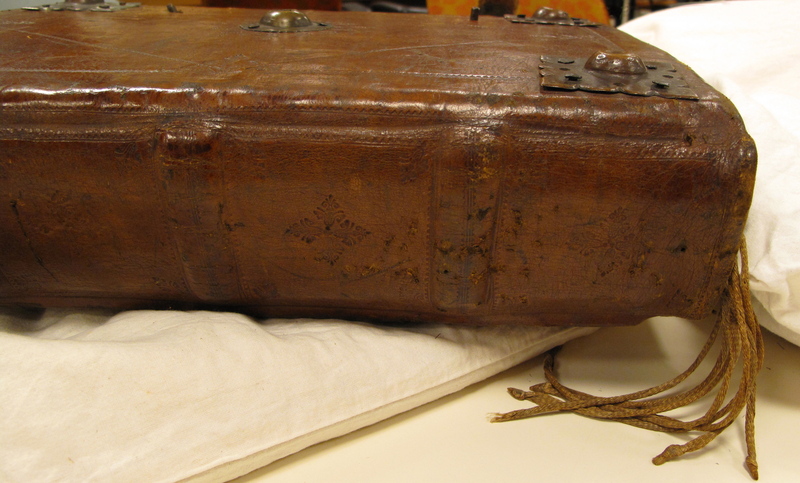 The book has two strap and pin-style fastenings. These close from the lower to the upper board (as was sometimes the case in Italian bindings). The book has also been fitted with five brass bosses at the corners and at the centre of both the upper and lower boards. One of these, from the upper board, has come away from the book and is kept in a separate box. Each boss is set on a small plate of metal, the whole structure fashioned from a single sheet of brass. 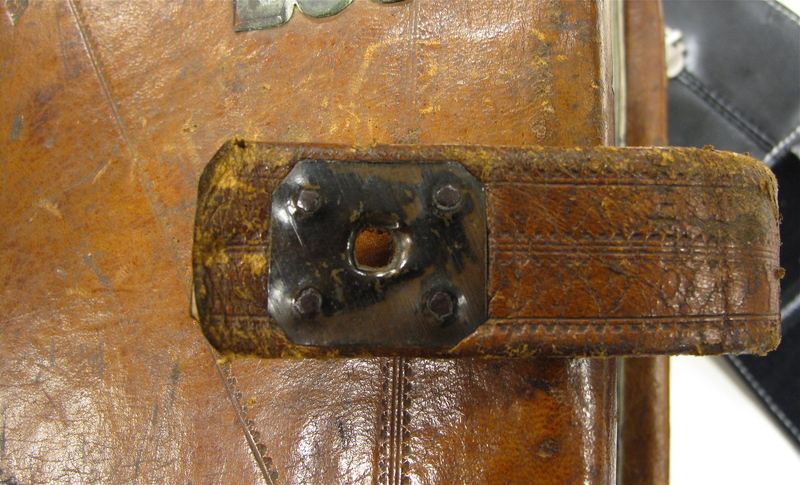 The book also has small plain brass “heels” on the edges of the boards at both head and tail. 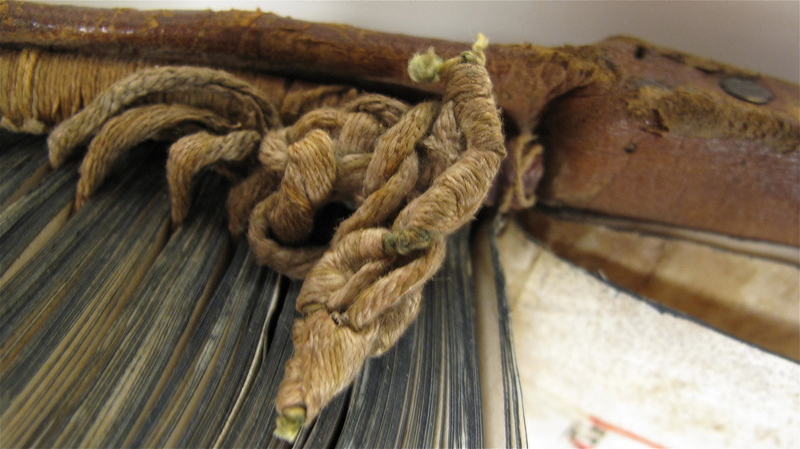 The book has a headband of plain thread over a brown leather core. It has not been laced into the boards, though this may be the result of later repair/recovering of the book. Instead, a few stitches affix it to the leather covering the spine. In this sense it resembles a “glued-on” endband in that it is a decorative feature. Emerging from the spine of the book are eight linen bookmarkers, now mostly in faded beige thread, but with some indications that they were once dyed green and yellow. We were unable to determine how this device was attached by the binder. Bookmarks of this kind appear in art of the late medieval period quite commonly but only rarely in books themselves. Similar bookmarks can be seen, for example, in the famous image of St Jerome removing a thorn from the lion’s paw, c.1445 (oil on panel) by Niccolo Antonio Colantonio, now in the Museo e Gallerie Nazionale di Capodimonte, Naples, Italy (a book with linen markers resembling the ones we have here appears on one of the shelves behind Jerome). Several books in Exeter Cathedral Library in England contain similar bookmarks, made from long strips of tawed leather rather than linen cords (for example, Exeter Cathedral MS 3515 which has a five-tailed leather marker, the upper end of which was stitched into the leather cover over the spine). For a full description of this manuscript including its binding, see Margaret M. Manion, Vera F. Vines, and Christopher de Hamel, Medieval and Renaissance Manuscripts in New Zealand Collections (Melbourne, London and New York: Thames and Hudson, 1989), no. 40; our work supplements their account. See also Migrations: Medieval Manuscripts in New Zealand, ed. Stephanie Hollis and Alexandra Barratt (Newcastle: Cambridge Scholars, 2007), 60. Medieval and Renaissance Manuscripts in New Zealand Collections, 70. We follow J.A. Szirmai in definining ‘medieval’ bookbindings as those constructed pre-1600, see The Archaeology of Medieval Bookbinding (Farnham: Ashgate, 1999). Another medieval depiction, from a woodcut, is described by Frank X. Roberts, “On Marking Books: A Medieval Scribe at Work,” accessed 1 June 2012, http://www.bibliobuffet.com/on-marking-books-columns-195/archive-index-on-marking-books/1011-a-medieval-scribe-at-work-040509.